I’ve previously alluded to my efforts to stay on a diet. Great pig that i am, there have at least been some benefits, the greatest of which being my internist looking up from reading about my blood sugar level on my lab reports and smiling. Oh, do i ever bask in that warm radiance. And well, there have been minor side effects, too, although i’m not sure they’re benefits – like being able to look down and without even craning my neck, see my obsolete genitalia. So the diet’s been working, and it’s clearly time for some food recommendations. My love affair with the Herrs at the Noe Valley Farmers’ Market continues since they offer something incredibly tasty throughout much of the year and the fresh green garlic has been replaced by green peas sold both within the shell and without. And yes, despite my general preference for unprocessed food, i find the shelled peas a vast improvement in convenience, indistinguishable in taste, and don’t tell the Herrs but no more expensive. Another food recommendation, and one which i’ve not touted for some time, is Rainbow Grocery which, in spite of its name, is not a gay grocery store but rather a worker-owned cooperative that is what the old “health food stores” were trying unsuccessfully to be. In addition to a great variety of organic fruit and vegetables at Ferry Plaza Farmer’s Market prices, they have a wide selection fresh dairy products; the largest variety of cheeses in town; a mind-boggling array of vitamins, minerals, and nutritional supplements; healthy cosmetics and soaps; a modest selection of kitchen tools; dozens of organic or fair traded chocolate bars; and a wide variety of bulk foods, many of which are of very high quality at unbeatable prices. So visit their bulk foods area if you want good food with minimal packaging (if you don’t have your own, simple bags are provided for the dry stuff but bring your own containers for the liquids). Things i buy regularly are the herbs and spices, agave nectar, peanut butter, roasted sesame oil, polenta, whole yellow cornmeal, and various wheat flours. I’ve just discovered their salted-and-roasted-in-the-shell peanuts, which are the best i’ve found since those glorious ones sold decades ago by Freed, Teller, & Freed in their store on Polk Street, freshly roasted and still warm for your munching pleasure as you walked. 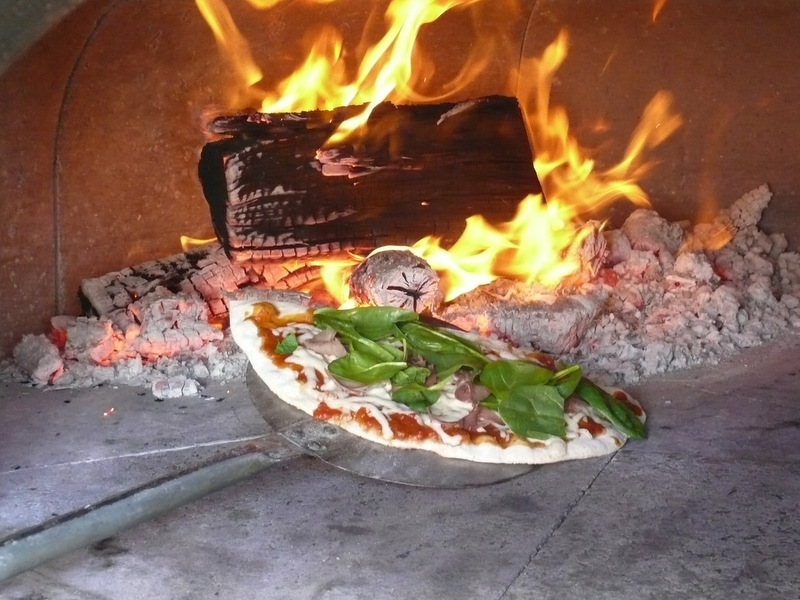 And speaking of warm, here’s downright hot, the oven at Copper Top Ovens, a mobile vendor of wood-fired pizzas, Wednesdays at the Heart of the City Farmers’ Market. That’s my prosciutto and spinach half pizza being slid in there. At 750 F, it’s done in three minutes. And delicious. Since we’re at the Heart of the City Farmers’ Market, i’ll put in a plug for Gary Alfieri. He has superb nut candies which i recommend your not tasting or you’ll be hooked and then your doctor will say you can’t eat them. But he also has the best almond butter around and even though he’d discontinued the 8 oz jars, which i loved because i could put my jellies in the empties, i grat my teeth the other day and bought a 16 oz. jar. And then another worker came over from the other end of the stall and told me that he’d made a dozen jars of the 8 oz. and had them at the Ferry Plaza Farmers’ Market for me. Yow! Our mothers told us not to complain, but as Adair Lara observed, how can anyone know there’s something wrong if you don’t complain? So my incessant mentions of my great love for the 8 oz. jars had born fruit….or at least almond butter. This, folks, is yet another reason to cultivate twenty-year relationships with your vendors. And finally, another plug for Company, my favorite restaurant. Until you try this place, dining in any other restaurant should be eschewed.